Expert tips for catching your limit despite the drought. Sparse winter snowpack in recent years has left northern Utah reservoirs at or near historic low levels. That has Park City anglers anxious about fishing prospects this summer. Nearby reservoirs, including Jordanelle, Rockport, East Canyon, and Echo, are mere puddles of their former selves. Fortunately for anglers, there is an upside to the arid spring. “Drought conditions change fishing, that’s all,” says Roger Wilson, chief of fisheries for the Utah Division of Wildlife Resources. “In fact, low water levels can mean better fishing. The fish are more concentrated and easier to find,” he explains. Wilson recommends boat anglers use fish finders to locate “suspended” fish and outriggers to troll in deeper water. Shore anglers should use sinking lines and weighted lures to deliver offerings. Most local reservoirs are managed as “two-story” fisheries. That means they’re stocked with two or more species, each with distinct water temperature and habitat preferences. Jordanelle and East Canyon, for example, are home to both trout and smallmouth bass. Wilson recommends anglers invest in a fishing thermometer and do a little homework to find appropriate water temperatures for the fish they’re after. In the searing dog days of summer, Wilson suggests that anglers head for the high country. Several lakes along Highway 150, a.k.a. the Mirror Lake Highway, above Kamas are heavily stocked with catchable-size rainbow trout throughout the summer. “Those lakes up there are pretty much drought proof,” Wilson says. Best bets include Trial, Washington, Pass, and Mirror Lakes. Wilson also shares a local secret: “In late summer, fish congregate at the inlet where the Weber River enters Echo Reservoir. 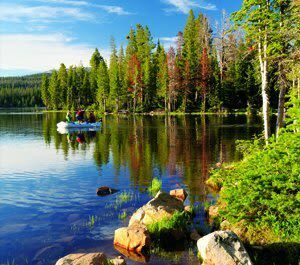 It can be really good fishing there.” Similar conditions may be found at the inlets to Rockport, Deer Creek, and East Canyon Reservoirs. “We’re going to watch the situation closely,” Wilson says. “Only if a fishery gets in trouble due to low water will we take some action.” Check the Division of Wildlife Resources website (wildlife.utah.gov) frequently this summer to stay up to date on any regulation changes and for the latest fishing reports.